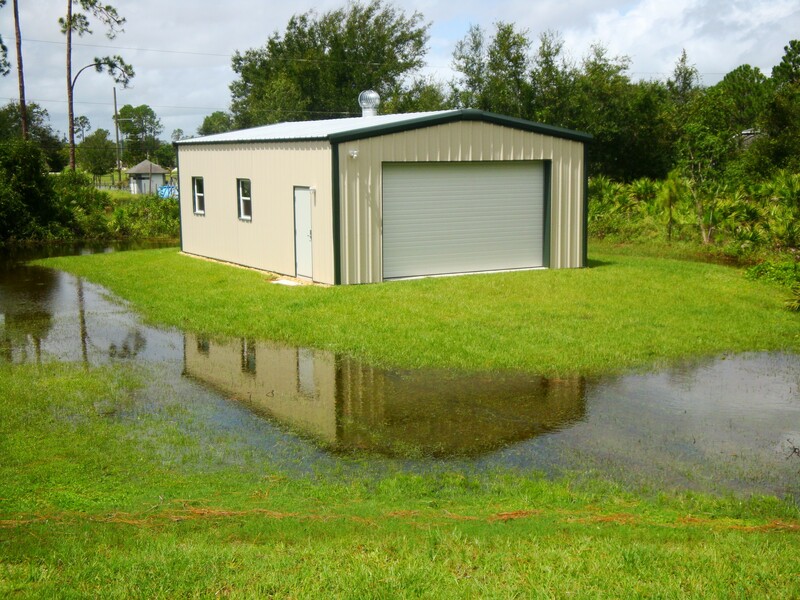 With a steel building, moisture can become problematic. The smallest exterior leak can lead to serious issues if given enough time, and the same can be said for condensation buildup on the interior. To protect your building and all of its contents, it is important to understand the issues that can arise from internal and external moisture and what you can do to prevent them. The most common issue is rust. Rust is the reddish-brown compound iron oxide, or Fe2O3, and it forms when iron and its alloys (like steel) react with oxygen and moisture. First, the surface will react and turn to rust. Soon, the entire metal will rust and disintegrate. The reaction is so common that it is actually rare to find pure iron in nature. One way to prevent rust is to add a layer of paint over steel surfaces. You can also opt for stainless steel, which does not rust. The reason for this is that stainless steel’s alloying elements interact differently with oxygen and moisture in the environment. This is largely due to the presence of chromium in the alloy, which helps react with oxygen to create a protective film that prevents corrosion by creating a chemical barrier between oxygen, water and the metal beneath the film. Technically, the steel does corrode, but only at the atomic level, too small for the human eye to see. Another problem caused by moisture is the growth of molds and mildews; two fungi that thrive on warmth and moisture and can grow on a multitude of surfaces. Mildew is a surface fungi. You can recognize it by its gray or white color. This fungi is easily cleaned with store-bought cleaners. Mold, however, is a much more serious fungi, often recognizable by its dark green or black color and its fuzzy, slimy texture. Mold can cause issues like allergies, asthma, lung problems, headaches and more. It’s also worth mentioning that both of these fungi smell awful. Leaks and fungi can give way to a third issue; pests. Insect infestations become much more likely when leaks and moisture are present. For example, water leakages provide mosquitoes with a perfectly stagnant water source to lay their eggs in. A small leak can become an infestation if not seen to quickly. Plenty of other insects simply seek out water sources to survive, which makes leak sites the most likely places for infestations of all kinds to begin. Plus, a multitude of insects, such as the the grain beetle, feed on the mildew and fungi that result from leaks and moisture. And don’t forget that the goods inside your steel structure are also at risk from leakages and moisture! Olympia steel buildings use Galvalume AZ55 roofing with a PBR system of galvanized purlins, girts and c-sections, which provide exceptional rust resistance due to the presence of aluminum in its chemical composition. AZ55 also comes standard with a rust-through perforation warranty of 40 years. Neoprene washers between the stainless steel screws and roof and sidewall steel paneling reduce cracks in the paint and damage to the panels that could otherwise result in leaks. Silicone-polyester coated and painted sidewalls provide an additional layer between the steel panels and the oxygen of the outside air. All of this means your building is protected from the leaks that create fungi and draw pests. To reduce interior moisture, it is recommended to use proper ventilation and insulation. To help decide on the perfect materials for your building, call us and talk to an expert today. We’ll provide the most cost-effective solution to your steel building needs. Olympia steel buildings use Galvalume AZ55 roofing, which provides exceptional rust resistance due to its primarily aluminum chemical composition. AZ55 also comes standard with a rust-through perforation warranty of 40 years. Combined with our stainless steel capped fasteners, with their limited lifetime rust warranty, and corrugated, leak-resistant roof paneling, you can rest assured that Olympia steel buildings should not leak.